It Was All A Dream: Spoilers Are Good For You The combination of instant commentary on Twitter and delayed viewing on DVRs and Hulu has made fans especially careful about spoilers. But according to one study, spoilers actually make you enjoy a work more than if you didn't know what was going to happen. 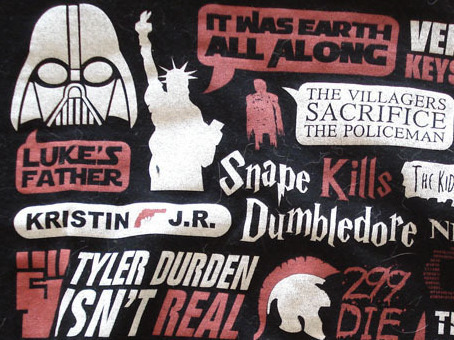 A T-shirt with many of the most infamous spoilers from movies, books and TV. A new study suggests that spoilers actually increase our enjoyment rather than ruin it. Chances are, if you're a regular reader of this blog you've read (or perhaps even posted) an incredibly vitriolic comment or two accusing the writer of the despicable crime of spoilers. Well, here's a surprise twist: Spoilers might actually make reading stories more enjoyable, according to a study conducted by researchers at the University of California San Diego. They gave their subjects short stories they hadn't read before, spoiling one group of readers but not others. So for example, when the assignment was Shirley Jackson's "The Lottery," some readers were informed about its joltingly morbid ending. Others weren't. It turns out that most of the people for whom the story was "spoiled" reported enjoying it more than those who read it unprepared. This doesn't surprise TV critic James Poniewozik, who stood up for spoilers in his Time magazine column last week. "It's much more terrifying to know that something horrible is about to happen than not to know it's about to happen," he tells NPR, citing Alfred Hitchock's theory of suspense. Poniewozik points out that increased cultural outrage over spoilers has a lot to do with today's technology. The way we watch TV has changed. More people delay watching their shows, turning to Hulu or their DVRs right as others are taking to Twitter and Facebook to write about, and often spoil, the episode. East Coasters routinely ruin big reveals for their friends lagging behind in other time zones. Plus, Poniewozik says, in a TV world desperately competing for ratings, the success of ABC's Lost created an over-reliance on shocking twists. Spoiler defenders point out that great writing and well-developed characters can't be spoiled. That's why people read Anna Karenina even though they know about, um, the train. But Dan Kois disagrees. He's written about spoilers extensively for New York magazine and Slate, and he argues that you can't compare literature to TV when it comes to spoilers. "I feel like a novel cannot offer the same kind of visceral shock and pleasure that a great plot twist in a visual medium usually can," he says. Spoilers can compensate in other ways, though, at least according to movie director Kevin Smith, a self-proclaimed spoiler lover. (Spoilers is even the name of his movie review show on Hulu.) He's a classic fanboy; a voracious consumer of all information about the shows and movies he cares about. One time, Smith tells NPR, he and his wife were watching a TV show they both adored, and Smith knew a big reveal was about to happen. He'd read about it on Twitter. So he casually pretended to predict it, impressing his wife. "You are so smart!" she exclaimed. "But really, it had been spoiled for me," Smith admits. If you don't want to be spoiled, Smith has a simple solution. It's so easy. Don't go on Twitter.